Taxpayers struggling with new tax laws could request an extension. The deadline for that, just like paying your taxes, is Monday. Individuals will need an application for automatic extension, a Form 4868, which may be submitted electronically or by mail. The IRS also allows individuals to pay their estimated income tax bill using Direct Pay, the Electronic Federal Tax Payment System or by credit or debit card without having to file a separate Form 4868. Forms are online at j.mp/2UKQHIL. LIMA — April 15 is almost here. If you haven’t yet filed your taxes, now is the time to decide whether to hire a professional, e-file or apply for an extension. The IRS says mistakes made while rushing to file a last-minute tax return can result in errors that may increase refund delays. But IRS data also show more Americans are procrastinating when it comes to filing their 2018 tax returns, and more taxpayers are turning to self-preparation services despite widespread confusion regarding the new tax law. The agency is expecting more Americans to file an extension this year. In December, the IRS projected 14.6 million taxpayers would apply for an extension, which grants taxpayers an additional six months to file their returns. The deadline to file an extension is Monday, April 15, same as the normal tax filing deadline. 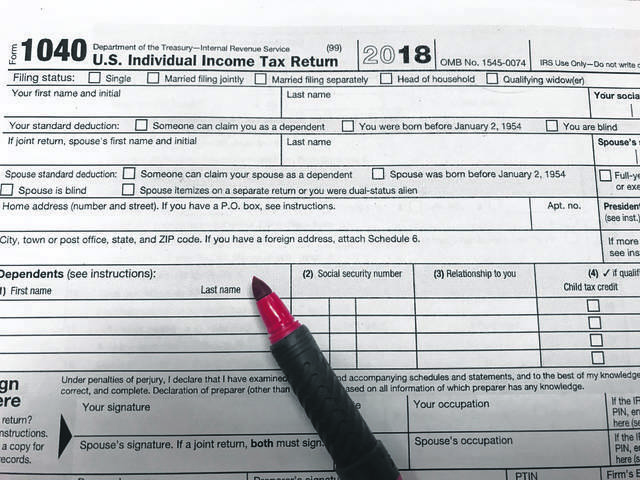 “If you look at your taxes and they appear to be overwhelming and you don’t think you’ll make the deadline, you can apply for an extension,” said John Navin, dean of the Dicke College of Business Administration at Ohio Northern University. An extension only gives late filers more time to complete their returns, as tax bills are still due by April 15, with or without an extension. The average individual tax refund is $2,995, down from $3,036 in 2018. But that doesn’t necessarily mean people are paying more federal taxes than before. Changes to withholding tables mean taxpayers are seeing more money in their paychecks, reducing the size of some refunds. Navin tells taxpayers who are unhappy with the size of their refund or tax bill to take a second look at their 2019 withholding “as soon as they get their taxes finished.” For most, that means checking in with their company’s human resources department. The IRS encouraged taxpayers since the tax law took effect to check their W-4 forms to make sure enough taxes were being withheld. The agency said anyone who owed this year should consider boosting their 2019 withholdings to avoid or lower their tax bills next year. There are other things taxpayers can do to maximize their 2019 returns. Navin recommends putting as much money as possible into 401Ks, health savings accounts and flexible spending accounts, which can be used for dependent care expenses.